The Arabesque Collection was influenced by an orchestra of timeless tradition and elegant sophistication. Each delicately crafted flacon represents a precious piece of art, steeped in the musings of old-world heritage and inspired by cherished moments of profound discovery. Playful, yet modern and refined, each design begins a concerto in the heart shaped scroll of a classic arabesque opera. The Arabesque Collection revitalizes century-old craftsmanship to provide a unique enchantment of irreplaceable inheritance. Each box features an enamel Travel Case adorned in diamond-cut Swarovski Crystals, complete with a set of 4 x 0.27 fl. oz. 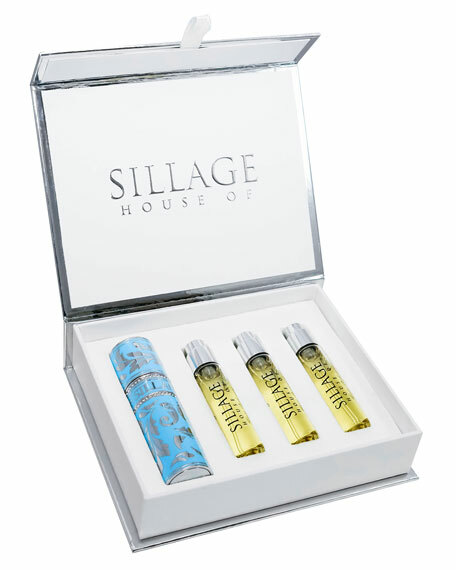 interchangeable vials of a specific fragrance.